Dog food matters. 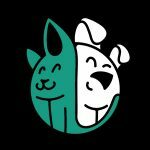 What you feed your dog will have a huge influence over their health and wellbeing throughout life, and we can’t overstate how important it is to carefully research canine nutrition before adopting a dog or puppy. Dogs depend on their food for every nutrient – from protein and carbohydrates, to the trace minerals needed to support the immune system, metabolism, and other vital functions. To make matters more complicated, not all dogs have exactly the same nutritional needs: a number of factors come together to determine which type of food is best for your pooch. Below, we run through these factors, so you can work out exactly what your dog needs for a happy and healthy life. Puppies rely solely on their mother’s milk from birth until they are at least four weeks old. Milk naturally supplies puppies with the protein, fat, and minerals required for them to have a healthy start in life, and also gives their immune system an initial boost with antibodies. At the four week mark, you should begin to introduce small amounts of solid food. Some petcare companies offer specifically designed weaning products, but any quality puppy food will suffice. Weaning puppies should be fed four small meals per day, and will naturally transition from milk to solid food in their own time, usually completing the process in about 10 days. At eight weeks old, puppies are generally finished weaning, and ready to go home with their new families. At this age, dogs grow rapidly, and need a food that can keep up with the intensive energy requirements this entails. Choose a food designed for puppies specifically, and be sure to check the label for AAFCO approval. This ensures the food has undergone trials, confirming that it offers complete nutrition. Puppy food tends to be calorie rich, and contain plenty of calcium and phosphorus for healthy bone growth. If your puppy is a large breed, such as a Labrador or Golden Retriever, it’s a good idea to select a specially formulated large breed food. The bones of larger dogs grow much more rapidly than their small breed counterparts, and require a different calcium and phosphorus ratio. You can switch from puppy food to adult food when your dog is fully grown, which usually happens when they are between 12 and 18 months old. The larger the breed, the longer they will take to reach their full size. Adult dog food is not as calorie rich as puppy food, reflecting the reduced caloric needs of your pet. These foods also dial back on fat, and instead offer pooches a balanced blend of protein and carbohydrates, along with essential vitamins and minerals. We will discuss different types of adult dog foods in more detail below. Dogs over seven years of age are considered senior. A dog’s metabolism slows down over time, reducing their energy levels, and resulting in lower calorie requirements from their food. Senior dog foods are less calorie dense than adult foods, and contain certain nutrients to tackle common age-related problems. In particular, a good senior dog food will include fish oils, chondroitin, glucosamine, or MSM. These additives promote joint health. Another consideration to bear in mind when choosing a food for your pooch is their lifestyle. Just like humans, dogs who are more active require more calories to maintain a healthy weight, and the type of food you choose can influence this. Working dogs have the highest caloric needs of all. From law enforcement to hunting and herding, pooches in employment tend to require more energy than their household counterparts. Dogs who regularly take part in high energy competitions, such as racing and agility courses, will also require a high calorie diet. Unfortunately, high quality foods for working dogs can be quite expensive, because of their rich meat-based formulae. Alternatively, you can choose a complete adult dog food, and feed your active dog 5 to 25% more than the label recommends for their size. Because working dogs tend to be larger breeds, you could also consider including a joint supplement in their diet. Although the average domestic dog loves to play, walk, and run, they simply don’t burn as many calories as their working counterparts, and you run the risk of obesity if you feed them a calorie rich diet. Most high quality dog foods contain the perfect balance of nutrients, and following the manufacturer’s feeding instructions is best. If your dog is less active than they used to be, even temporarily, their diet should reflect this to avoid the myriad health problems associated with extra weight. Obese canines are at a much greater risk of developing type two diabetes, high blood pressure, kidney disease, respiratory issues, and even heart problems or cancer. Unfortunately, according to a study by pet nutrition specialists, Hills, up to 54% of dogs in the USA are overweight. To help prevent, or combat, canine obesity, you should avoid feeding your dog treats, and consider investing in a dog food designed to promote weight loss. These foods contain all the vitamins and minerals you would expect from a high quality dog feed, but feature more protein, and less fat than average. They also tend to be high in healthy fiber, to help prevent hunger pangs and promote healthy digestion. Eating the right foods can actually go a long way to resolving or managing health issues. 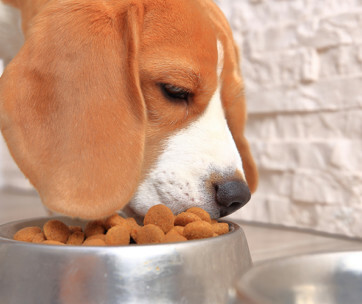 Although we wouldn’t recommend skipping a visit to the vet’s in favor of a sudden change in diet, certain health factors can and should influence what food your dog eats. Although it isn’t a ‘health condition’ per se, neutering is a factor which influences how you should feed your pet. The process alters your dog’s hormonal balance quite profoundly, slowing down their metabolic rate. This means that they require fewer calories than their non-neutered counterparts. The effect is particularly noticeable in female pooches. Like all mammals, dogs require extra calories during pregnancy and nursing. In the final weeks of pregnancy (6-9), mothers should be fed a higher energy food. Simply upping her intake of regular food is often not enough, since her stomach capacity is reduced by the presence of the puppies. To provide the calories she needs, you can feed a pregnant dog puppy food. Continue to feed her this food during nursing, and ensure she has constant access to water, as dehydration can stall milk production. Once her puppies have weaned, you can gradually restore her to her usual food. Surprisingly, some breeds are more prone to allergies than others. If you own a boxer, spaniel, collie, retriever, or dachshund, allergies are more likely to occur. If you suspect your dog is suffering from a food allergy or intolerance, check with your vet as soon as possible. Luckily, it’s fairly easy to find foods that avoid the ingredient your dog is allergic to. For allergy-prone dogs, it’s a good idea to choose a limited ingredient food, which helps you maintain better control of what they’re eating. Minor skin conditions are one symptom of food allergies in dogs, so switching their diet can be a simple and effective way to resolve them. To promote a healthy coat in general, look out for foods containing omega-3 and 6 fatty acids (commonly found in fish oil), biotin, vitamin A, and Zinc. You should also bear in mind that joint problems can be exacerbated and even triggered by excess weight. To keep your dog’s joints in tip top condition, encourage regular exercise and avoid overfeeding. Certain behavioral issues can also be triggered by food. 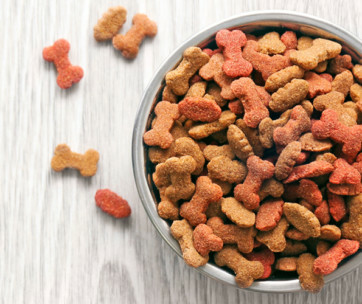 The artificial additives in some dog foods may be linked to hyperactivity – just like the link between junk food and hyperactive children. If your dog seems to be anxious or hyperactive, it’s a good idea to look out for a food which avoids using artificial colors, flavors, or preservatives in its recipe. 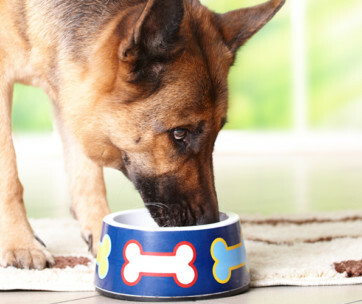 Your dog’s diet can also affect the health of their urinary tract. Urine is produced by the kidneys as they remove toxins from the blood, and one of these toxins, urea, makes a great snack for nasty bacteria. In other words, urine with a high urea concentration is more likely to trigger urinary tract infections. To help combat this, ensure your dog is always well-hydrated, since this helps to produce diluted urine, which is less infection-prone. Dogs with a particular weakness to urinary conditions may also benefit from a low protein diet, since urea is the product of protein digestion. If your dog is experiencing urinary problems, always consult your vet before you consider switching their diet. Low protein diets can be dangerous for some dogs, because they tend to result in lower muscle mass. Throughout this blog, we’ve mentioned ‘high quality’ dog food, and now it’s time to talk about exactly what that means. Turning your eyes towards the ingredient lists of many dog foods can often be overwhelming to say the least. To help combat confusion, we’ve compiled a simple list of things to look out for on a food label to ensure you’re making a healthy choice for your dog. AAFCO is the American Association of Feed Control Officials, and is responsible for performing tests of nutritional quality on various dog foods. For the food to meet their requirements, it must ‘provide complete and balanced nutrition for maintenance of adult dogs’. If this AAFCO label is missing the food is not likely to feature a high quality recipe. When checking out the ingredients list for a dog food, remember that they’re listed in descending order by volume. Seeing recognisable, natural ingredients at the start of the ingredients list is a good indication that the food is a healthy choice. In a top quality food, you should see meat, vegetables, and whole grains at the start of the list. Good quality foods will contain a healthy protein source, such as chicken, turkey, or fish as their first ingredient, whereas lower quality options will list grains or meat by-products. When you’re looking out for natural ingredients, you might be tempted to categorise products such as ‘chicken meal’, or ‘beef meal’ as processed, and therefore unhealthy. However, high quality meat meals actually pack in considerably more protein than non-processed meats, since the cooking process has removed much of the water that meat usually contains. This isn’t to say that dog foods which prominently feature meat meals are never low quality – if the main ingredient is a meat byproduct meal, you can bet good money that’s a low quality food. The first three of these ingredients are preservatives that have been linked to increased cancer risk, while the last two aren’t harmful per se, but provide no nutritional value, indicating a low quality recipe. Foods which depend on fibrous fillers with low nutritional value are not likely to be of a high quality. Look out for fillers such as rice bran, hulls, corn brand, and wheat mill run. These ingredients don’t add much to the food except volume, indicating it has been cheaply made. Although dogs do need fiber in their diets, this should come from whole grains and vegetables. As we have seen, choosing a healthy and nutritious food for your dog can be a surprisingly tricky business. However, by following our guide, we’re confident you’ll find yourself equipped with the information you need to make a healthy choice. We hope this helps you find the perfect food for your pooch!